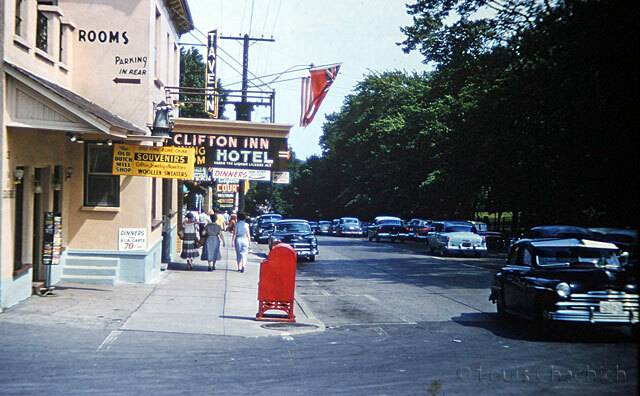 Here is a shot taken by my father in 1954 on Clifton Hill in Niagara Falls, Ontario, Canada. My parents would have been young newlyweds at that time. They probably did not stay at this hotel but it’s possible. The Old Dutch Mill Shop was selling souvenirs of Fine Bone China, Gifts, Jewelry, Novelties and, of course, Woollen Sweaters. It’s a far cry from the Clifton Hill of today which is filled with kitsch.